Around 23,000 Americans die from antibiotic resistant infections each year and thousands more succumb to longer, riskier, and more expensive hospital stays. Antibiotic resistance costs the United States billions of dollars annually in direct healthcare expenses and lost productivity. Antibiotics are an essential part of the health care we receive, yet 80% of those sold in the United States—the same medicines used to treat human infections—are used in industrial animal agriculture as a stopgap against crowded, unsanitary conditions and to promote growth. This overuse and misuse of antibiotics is breeding antibiotic resistant bacterial strains and endangering human health. 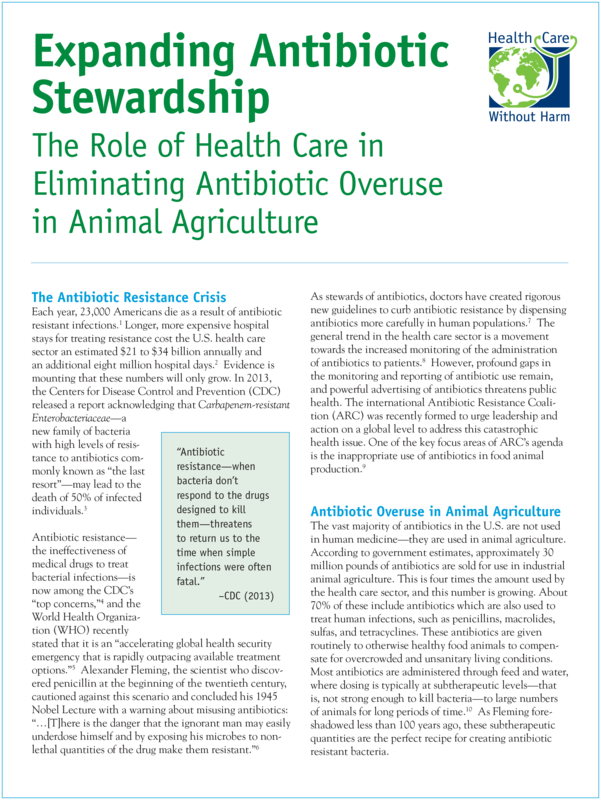 More than 300 leading medical organizations, including the American Medical Association, the American Public Health Association, and the American Academy of Pediatrics agree that we must address the routine and non-therapeutic uses of antibiotics in animal agriculture as part of a comprehensive strategy to address antibiotic resistant infections and preserve the efficacy of antibiotics for health care. The Healthy Food in Health Health Care program with support from the Pew Charitable Trusts works to end routine, non-therapeutic use of antibiotics in agriculture by empowering the healthcare sector to utilize its purchasing influence and moral authority to preserve the efficacy of these medicines. Our national and regional organizing efforts focus on hospital food service purchasing, public policy, and health professional engagement. Collaborating with Practice Greenhealth and their Healthier Hospitals program, the Healthy Food in Health Care program partners with more than 1,000 hospitals across the country that have committed to serving meat raised without unnecessary antibiotics.